Edited Hubble Space Telescope montage (created by NASA) of various galaxies with growing black holes due to collisions with other galaxies. Color/processing variant. Original caption: Some of the Hubble Space Telescope’s most stunning images reveal galaxies in distress. Many of them are in the throes of a gravitational encounter with another galaxy. The photos show perfect pinwheel patterns stretched and pulled into irregular shapes. 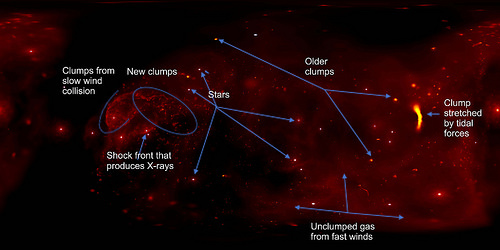 Streamers of gas and dust flow from galaxies into space. And in this chaos, batches of young, blue stars glow like tree lights, fueled by the dust and gas kicked up by the galactic encounter. For some galaxies, the powerful meeting with a passing galaxy will eventually end in mergers. 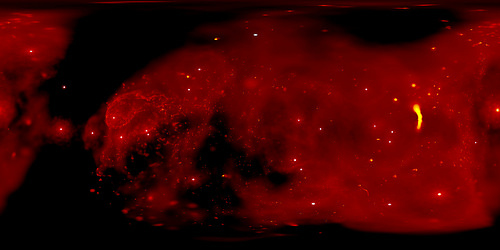 The study is the largest survey of the cores of nearby galaxies in near-infrared light. The Hubble observations represent over 20 years’ worth of snapshots from its vast archive. 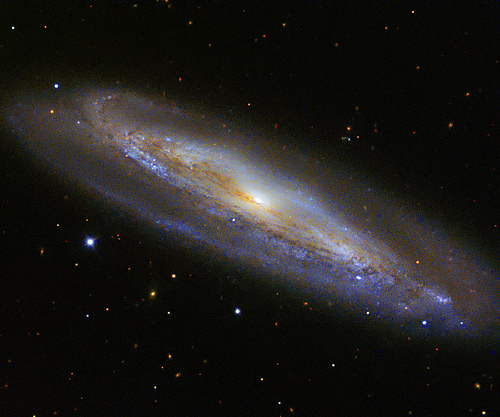 The survey targeted galaxies residing an average distance of 330 million light-years from Earth. The census helps astronomers confirm computer simulations showing that black holes grow faster during the last 10 million to 20 million years of the galactic merger. The Hubble and Keck Observatory images captured close-up views of this final stage, when the bulked-up black holes are only about 3,000 light-years apart — a near-embrace in cosmic terms. The study shows that galaxy encounters are important for astronomers’ understanding of how black holes became so monstrously big. Another original caption: Peering through thick walls of gas and dust surrounding the messy cores of merging galaxies, astronomers are getting their best view yet of close pairs of supermassive black holes as they march toward coalescence into mega black holes. 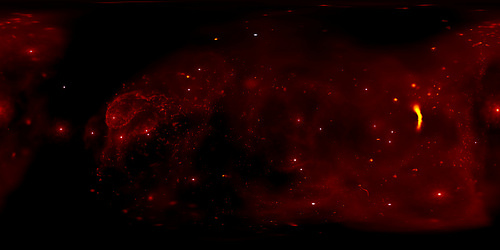 A team of researchers led by Michael Koss of Eureka Scientific Inc., in Kirkland, Washington, performed the largest survey of the cores of nearby galaxies in near-infrared light, using high-resolution images taken by NASA’s Hubble Space Telescope and the W. M. Keck Observatory in Hawaii. 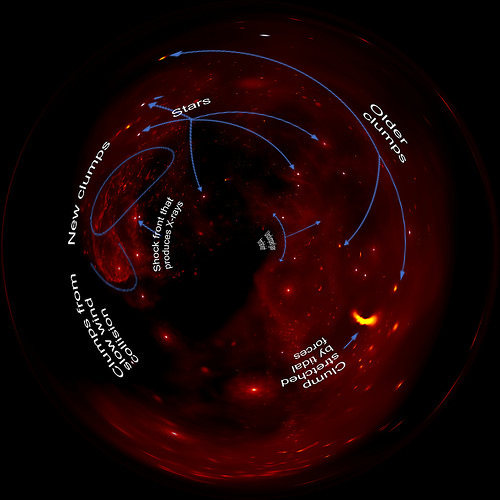 The Hubble observations represent over 20 years’ worth of snapshots from its vast archive. "Seeing the pairs of merging galaxy nuclei associated with these huge black holes so close together was pretty amazing," Koss said. "In our study, we see two galaxy nuclei right when the images were taken. You can’t argue with it; it’s a very ‘clean’ result, which doesn’t rely on interpretation." "Computer simulations of galaxy smashups show us that black holes grow fastest during the final stages of mergers, near the time when the black holes interact, and that’s what we have found in our survey," said study team member Laura Blecha of the University of Florida, in Gainesville. "The fact that black holes grow faster and faster as mergers progress tells us galaxy encounters are really important for our understanding of how these objects got to be so monstrously big." It’s not easy to find galaxy nuclei so close together. Most prior observations of colliding galaxies have caught the coalescing black holes at earlier stages when they were about 10 times farther away. The late stage of the merger process is so elusive because the interacting galaxies are encased in dense dust and gas and require high-resolution observations in infrared light that can see through the clouds and pinpoint the locations of the two merging nuclei. The team first searched for visually obscured, active black holes by sifting through 10 years’ worth of X-ray data from the Burst Alert Telescope (BAT) aboard NASA’s Neil Gehrels Swift Telescope, a high-energy space observatory. "Gas falling onto the black holes emits X-rays, and the brightness of the X-rays tells you how quickly the black hole is growing," Koss explained. "I didn’t know if we would find hidden mergers, but we suspected, based on computer simulations, that they would be in heavily shrouded galaxies.Therefore we tried to peer through the dust with the sharpest images possible, in hopes of finding coalescing black holes." 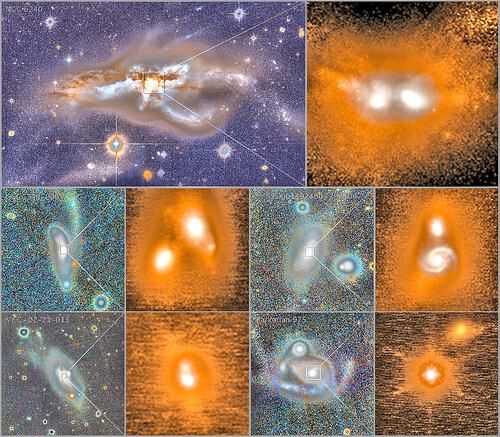 The researchers combed through the Hubble archive, identifying those merging galaxies they spotted in the X-ray data. They then used the Keck Observatory’s super-sharp, near-infrared vision to observe a larger sample of the X-ray-producing black holes not found in the Hubble archive. To verify their results, Koss’s team compared the survey galaxies with 176 other galaxies from the Hubble archive that lack actively growing black holes. The comparison confirmed that the luminous cores found in the researchers’ census of dusty interacting galaxies are indeed a signature of rapidly growing black-hole pairs headed for a collision. Future infrared telescopes, such as NASA’s planned James Webb Space Telescope and a new generation of giant ground-based telescopes, will provide an even better probe of dusty galaxy collisions by measuring the masses, growth rate, and dynamics of close black-hole pairs. The Webb telescope may also be able to look in mid-infrared light to uncover more galaxy interactions so encased in thick gas and dust that even near-infrared light cannot penetrate them. The team’s results will appear online in the Nov. 7, 2018, issue of the journal Nature. 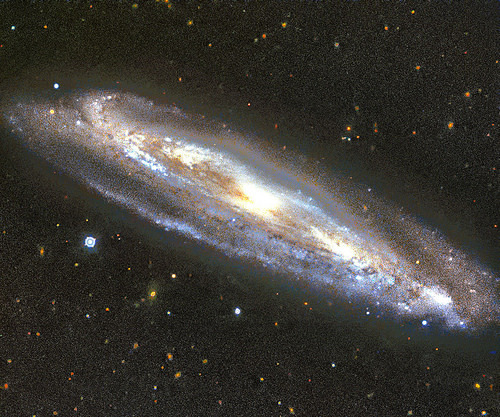 Edited European Southern Observatory image of the galaxy NGC 4192 (or M98). 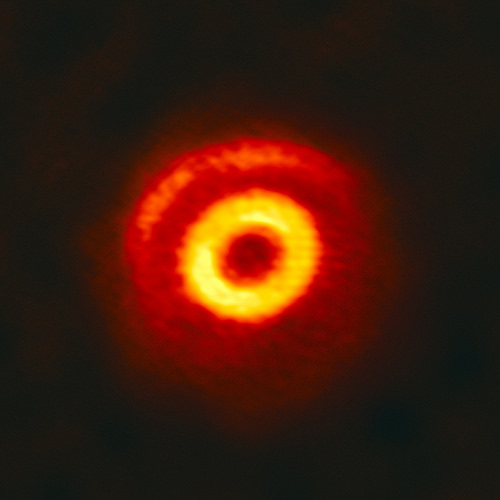 Edited European Southern Observatory image of the star V1247 Orionis, set in a ring of dust and gas. Original caption: This image from the Atacama Large Millimeter/submillimeter Array (ALMA) shows V1247 Orionis, a young, hot star surrounded by a dynamic ring of gas and dust, known as a circumstellar disc. This disc can be seen here in two parts: a clearly defined central ring of matter and a more delicate crescent structure located further out. The region between the ring and crescent, visible as a dark strip, is thought to be caused by a young planet carving its way through the disc. As the planet orbits around its parent star, its motion creates areas of high pressure on either side of its path, similar to how a ship creates bow waves as it cuts through water. These areas of high pressure could become protective barriers around sites of planet formation; dust particles are trapped within them for millions of years, allowing them the time and space to clump together and grow. The exquisite resolution of ALMA allows astronomers to study the intricate structure of such a dust trapping vortex for the first time. The image reveals not only the crescent-shaped dust trap at the outer edge of the dark strip, but also regions of excess dust within the ring, possibly indicating a second dust trap that formed inside of the potential planet’s orbit. This confirms the predictions of earlier computer simulations. Dust trapping is one potential solution to a major stumbling block in current theories of how planets form, which predicts that particles should drift into the central star and be destroyed before they have time to grow to planetesimal sizes (the radial drift problem). 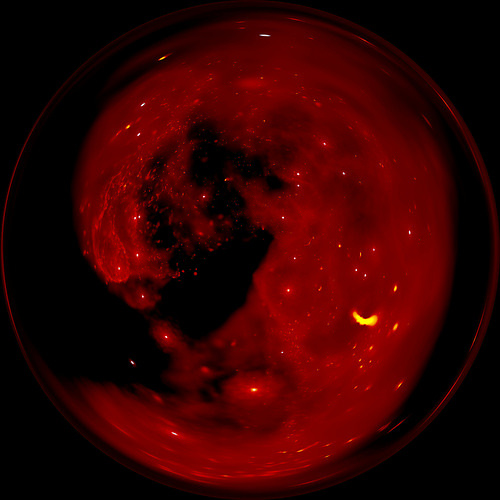 Edited European Southern Observatory image of the star V1247 Orionis, set in a ring of dust and gas. Color/processing variant.